Birmingham's Blairite Labour council won't get an easy Christmas this year. Two of its workforces - bin workers and home carers - are balloting for strikes. And protests will continue against the sell-off of the city's nurseries. Bin workers struck to save jobs and beat the Blairite council last year, after three months of action led by general union Unite. But new information suggests the council paid £4,000 to workers who did not strike - in effect, blacklisting striking Unite members. Birmingham's Labour council disgusted many by spending £6 million on a strike-breaking workforce during the dispute. It is sinking still further with these payments. At a Unite meeting, furious bin workers called for fresh strikes in response. The ballot will close on 14 December, and if successful the workers will be out from 28 December. The workers who received the council's extra payment are represented by general union GMB. We need action to unite bin workers in struggle, not divide them so the employer can pick them off. The GMB has not endeared itself to Birmingham nursery workers and users either. It has agreed the Blairites' plan to privatise or close the 14 remaining council-owned nurseries. As we go to press, Birmingham home carers are also returning ballot papers. Under the Tories' anti-union laws, they must refresh their strike vote every six months. Their dispute over cuts to hours and pay - up to £11,000 a year for some - has already hit 12 months and 47 strike days. Rank-and-file members have pushed local leaders of public service union Unison to put more political pressure on the Labour council. 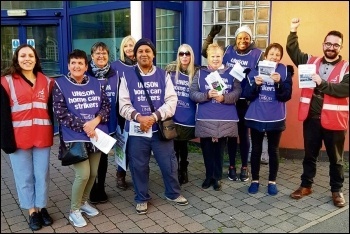 Frustrated that councillors have tried to ignore their action - less visible than the piles of refuse during the bin strike - home carers leafleted key cutters' wards. Council leader Ian Ward's area was fully leafleted in just 90 minutes! The leaflet asks residents if their councillors, by attacking low-paid women and their service users, represent "Labour values." Councillors promised a meeting with the unions so long as home carers ceased leafleting immediately! But the council has gone back on its word before. Ahead of May's council elections it promised home carers could trial their own self-rostering system if they called off strikes. As soon as the elections were over, so was the self-roster trial. The bin workers' victory in 2017 was a source of inspiration for the home carers to take on the council themselves. Joint strikes by these workers would strengthen both disputes. Nursery campaigners could join up too. They are all fighting the same enemy and the same threat to jobs, pay, conditions and public services. And as well as industrial pressure, the unions should work together to apply political pressure on the Labour council. Last year, Unite assistant general secretary Howard Beckett rightly told the council: "If you act like Tories, we'll treat you like Tories." The unions should withdraw support from any councillor who continues to impose austerity. Anti-cuts councillors would instead use the platform to build a mass campaign to win more funding from central government, using reserves and borrowing to set no-cuts budgets in the meantime. Birmingham workers can lead the way by applying pressure in their unions. Fight every cut, fight for socialist policies!